Hiccups come with the process of dealing with interior design, because like any normal project, problems are bound to occur. But there are simple solutions for most interior issues that pop up once in awhile, and below we've rounded up a few common ones in hopes they'll be of some help along the way! There are several methods that help illusively expand a tiny area. The first includes painting horizontal stripes across perhaps one your walls, allowing the space to appear wider than it really is. The second, and subtler solution, involves placing a large mirror within the space, making the room look as if it's twice as large. 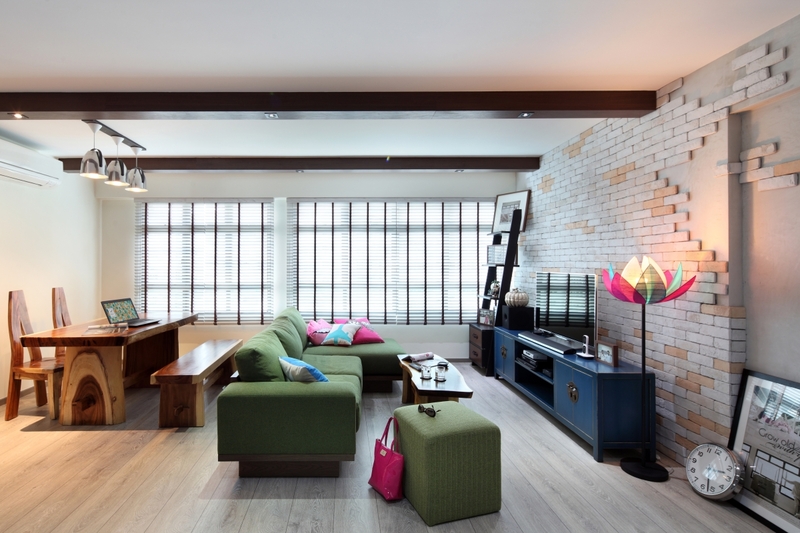 Some houses come with an open plan, but the space can feel awfully large and bare at times. To alleviate this problem, simply add a divider within the area, one that can easily be removed should you change your mind in the future. A commonly used example would be bookshelves, the kind that's large enough to separate a huge area, creating a break of sorts somewhere in the middle. If low ceilings irritate you, you could try installing ceiling to floor curtains. They'll easily maximise and elongate the space in between. If that doesn't solve the problem entirely, then try introducing transparent furniture into the space. This allows light to stream in seamlessly, bouncing off surfaces with no obstruction. Although bookshelves are meant to be practical pieces of furniture, sometimes we can't help but notice they feel a little too messy for our liking. If that's a problem you're facing now, spruce it up with decorative items, like accessories and artwork. This not only brightens your bookshelf, but also causes distractions that will make the mess look much less obvious. People have the misconception that wall colours should be selected earliest, since it's the first thing that gets worked on in a room. But in fact, they should be decided last, after you've picked out a roomful of furniture. This ensures the colours won't clash with anything you've bought, because it'll be disastrous if you regret later on. If you're currently facing this problem, we suggest redoing the paint job, because wall colour isn't something you can easily ignore; it'll continue bothering you until you change it. People redecorate all the time. Sometimes the project is focused on a single room, but sometimes it involves the entire house. Whichever it is, redecorating is no doubt a tiring task that requires a lot of vision and brainpower. This can in turn create stress, because you end up being so wary of making the wrong choices. Redecorating then becomes a pain by this point, and believe us when we say your mood is going to translate into your home's design. So what you should do is relax, enjoy the process and trust your instincts, since it's the only way to bring out the best decorative ideas you unknowingly harbour in the deepest depths of your mind!